There’s no doubt about it. Santa Monica’s bite reconstruction dentist, Dr. Sam Muslin, is garnering a lot of attention. His website gets more than 1,000 visitors a day, and tens of thousands of people have watched his YouTube videos about optimized bite correction that improves the shape of the patients face. Patients fly in from London, Paris and Singapore for treatment. More importantly, his patients are so happy with their non-invasive full-mouth restorations that they readily talk about it! They are ready to defend him as the Best Dentist in Santa Monica. The difference between a regular Cosmetic Dentistry and Porcelain Veneers smile and Bite Correction with VENLAY® Restorations. Irene knows a good dentist when she sees one; her brother is a dentist, too! By reducing stress in the jaw and neck, Dr. Muslin, (Master of the Academy of General Dentistry) , actually is optimizing long-term health. His dental method using VENLAY® restorations makes it possible to get treatment without grinding down healthy teeth. All of the other dentists wanted to grind my good teeth down to stubs for porcelain crowns to fix my bite so I was very impressed with how easy it is when none of healthy teeth needed to be ground down”. A constant bath of stress hormones such as cortisol and epinephrine taxes the endocrine system, as well as the rest of the body. Heart rate, blood pressure, metabolism, sleep quality, digestion, reproduction and the immune system are just a few of the things that react negatively to constant stress. 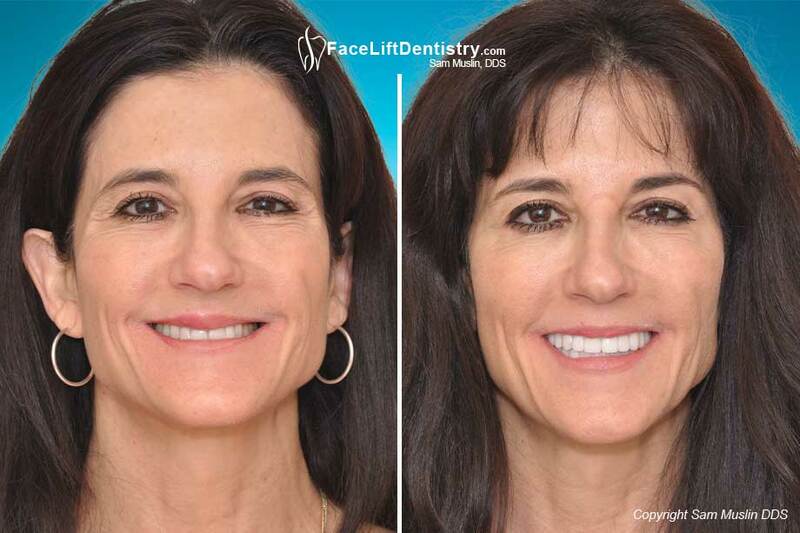 By correcting bite mechanics and maximizing oral health with Dr. Muslin’s trademarked Face Lift Dentistry® method, pain disappears and the body starts to heal. The anterior insula and the anterior cingulate cortex – parts of the brain that register pain – get to rest. So, do the brain centers that regulate hormone release. Fewer free radicals are created, lowering cell damage in the body. Health makes a gradual comeback, and this registers on the face, in the mirror and throughout the body. Dr. Muslin believes that when the mechanical stress is reduced, the body can begin a natural healing process without surgery, braces or grinding down good teeth. “Some patients want the treatment because they look younger, while others want the treatment because it is both good for their health and also because they look younger due to the bite being corrected,” explains Dr. Muslin. “Most people have a bite that compromises them physically, but because they have never experienced anything else, they live with it. I have treated my patients with braces for nearly 20 years, have treated my patients with bite reconstructions for over 35 years, and have a unique prospective in the profession with extensive experience in all areas. With this experience, I can help patients make good decisions.” If I think that surgery or braces is a better option, I will tell the patient because I have experience in all areas of dentistry”. The 2015 LA’s Best Dentist has been awarded to Santa Monica’s Dr. Sam Muslin. As a leading general and cosmetic dentist, Dr. Muslin has proved that his dental practice is appreciated, customer focused and innovative. To set up a consultation with Dr. Sam Muslin, call his treatment coordinators at (310) 829-6796, or go to the contact page on his website and fill out the information request form. Visiting this dentist can transform the health and appearance of the patient and helps them be all that they can be says Dr. Muslin.